Define the benefits of sliding door systems for health-care environments, including efficiency of space, acoustics, privacy, and aesthetics. Identify a variety of door and frame products/materials that are especially beneficial in health-care design and construction. Explain the use of accessible floorplans and access control to provide safety and security in health-care environments. Describe advances in door hardware, specifically hinge systems, and how they can aid in medical facility functionality. 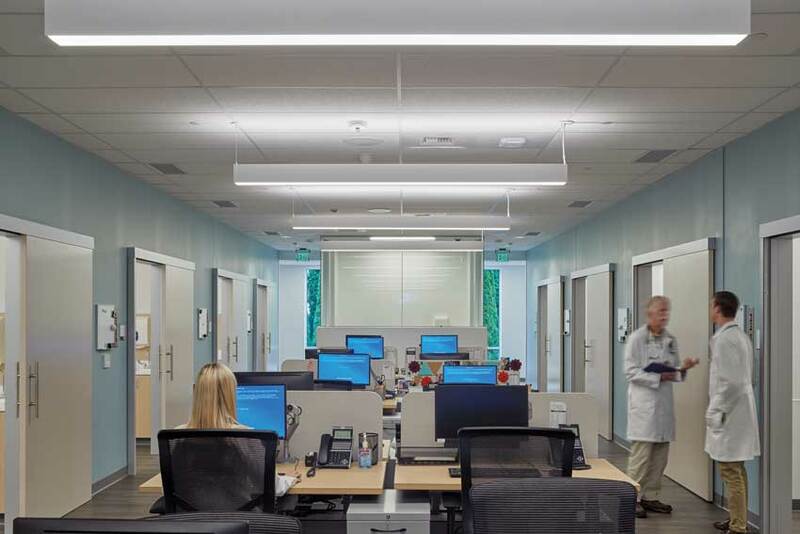 Discuss how wall protection, curtain tracks, roller shades, and daylighting can provide added value and efficiencies within a health-care setting, specifically behavioral health facilities. With health care dominating the news cycle every day, it’s not surprising that for most people, the topic first elicits thoughts of rising costs, insurance quality and affordability, and your provider’s credentials. But, increasingly, architects, construction professionals, and owners are considering how the building design aspects of health systems are critical components in order to improve the quality of care and deliver it at a lower cost by operating more efficiently, improving patient outcomes, and increasing patient satisfaction. 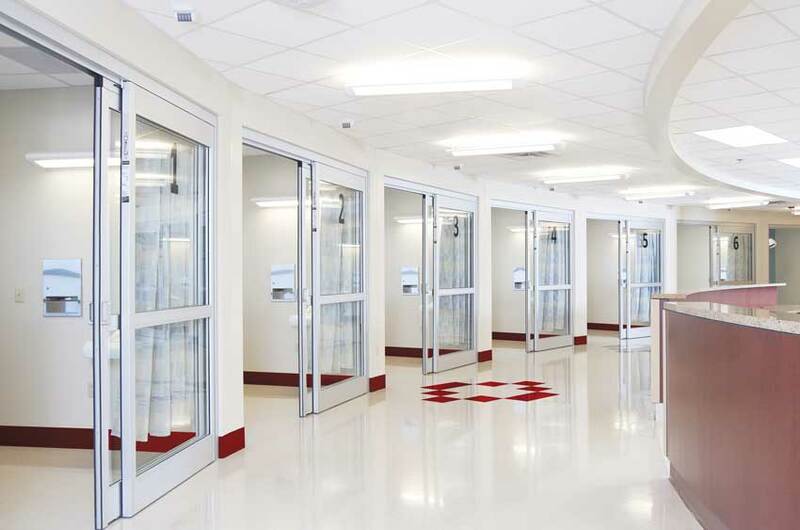 A new wave of innovative building products, such as these manual sliding ICU doors used at the Winslow Medical Center ER, help create modern, patient-friendly, efficient health-care environments. Building product manufacturers are taking the lead and meeting this growing demand for innovative solutions for health-care facilities. 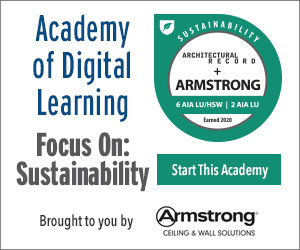 This course will examine a range of products—including doors and framing, hardware, window treatments, and flexible wall protection—and how they can aid in creating safe, structurally sound, efficient spaces that not only bring about patient satisfaction and optimal healing environments but also impact the owners’ bottom line. Health-care settings—everything from multi-facility hospital systems to medical office buildings and local clinics—all share several common goals and challenges. Increasingly, governing boards, invested shareholders, and owner-partners are keeping a watchful eye on building practices so as to keep operating costs down while increasing patient volumes and their access to quality care. Regardless of the venue, efficiency is at the center of every decision. Designers and facility managers are constantly looking for ways to bring their buildings in line with these ideals, and the right doors and frame products can be an integral part of the solution. Modern door products, especially sliding door systems that include a complete door, frame, and hardware assembly, can make an important contribution to clinic design and ROI through the efficient use of space. 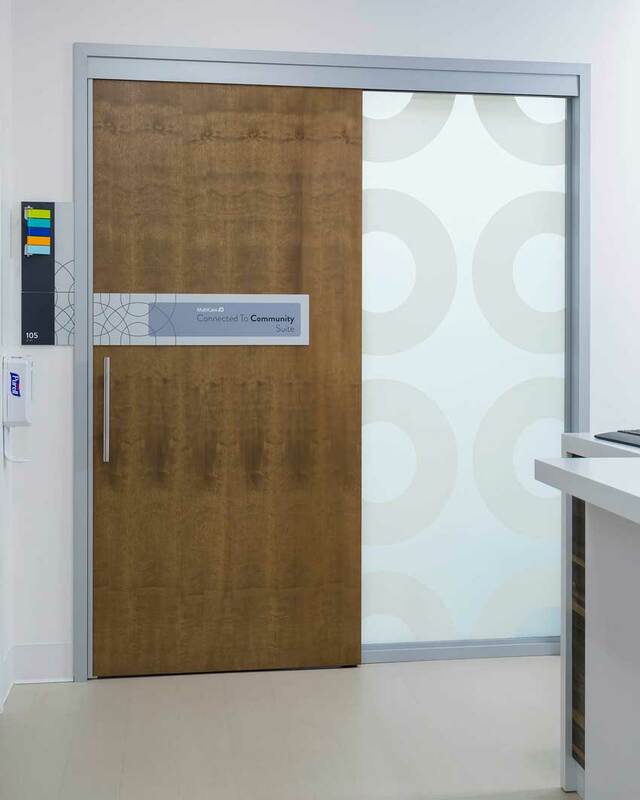 The latest sliding door systems have been designed to cater to the specific demands of health-care environments and address issues of unique concern in medical settings, such as acoustics, cleanability, hardware options, smoke ratings, and reliability. Architects and professional building managers have many types and styles of interior doors from which to choose for medical facilities. Sliding doors can be a simple, smart solution that provides numerous benefits, some of which are outlined below. Use of space: Sliding doors allow more exam rooms to fit into the same floor plate and provide a more efficient layout of individual rooms. When doors slide rather than swing out, an average of 14 square feet of valuable square footage is freed up for accommodating medical teams, furniture, and equipment. Health-care sliding doors, by their very nature, are designed to be unobtrusive, hugging the wall when open and gently gliding into place when closed. Visually appealing: Sliding doors are generally thought of as an aesthetic upgrade that gives clinics a more modern, less institutional feel. Health-care sliding doors are available in a variety of materials and styles (example: flush wood or plastic laminate door leaves; clear, frosted, or decorative glass; or special features such as integral blinds or lead shielding) and will fit most budgets and décor. They may also employ a durable concealed roller system that provides a low-maintenance, smooth glide over their life cycle. Door frames may wrap the wall openings to protect them from wear and tear and give a long-term professional appearance. Increased performance: Many sliding doors are designed so that performance is not compromised, i.e., architects can specify sliding doors with good acoustic performance (for instance, some newer products feature acoustical seals at all four sides for maximum and acoustical performance and acoustical design that addresses sound leakage at the lead and jambs), smoke ratings, locking and latching hardware, and a full range of decorative finishes. ADA compliance: Some manufacturers offer sliding door systems that are ADA compliant in terms of operating force and clear opening dimensions. Products may include ADA-approved thumb-turn locks with occupancy indicators or keyways and self-latching doors options with handles that can be operated with only one hand. Another example would be sliding doors with soft-close features that offer protection to younger or slower fingers and that stop nerve-jarring slams. Today’s sliding door systems are designed to serve the demands of health-care environments, such as acoustics, cleanability and reliability—among others. A new sliding door design system allows for a more flush look than a mainstay surface-mounted barn door design at MultiCare Indigo outpatient clinics. When BCRA Architects of Tacoma, Washington, approached Goldfinch Brothers and a specialty sliding door manufacturer with a design request for its upcoming MultiCare Indigo outpatient clinics, it was the perfect opportunity to roll out a new product design to meet the space needs and aesthetic intent for the projects. Requiring a more flush look than a mainstay surface-mounted barn door design, a new sliding door design system was launched for the project. The design features a door that slides over a sidelite where both the door and sidelite can fit within the rough opening (as opposed to surface mounted to the face of the wall with a standalone barn door design). The flush wood door has applied signage and a decorative glass sidelite that allows for light transmittance while safeguarding visual privacy. The inset design meets the key design intent of having the door rest flush with the wall for a clean aesthetic and preservation of hallway clearances down the corridors.